They were sitting in the middle of the physics common room with its mismatching furniture: red carpet, pale orange curtains, walls of magnolia and wood panelling, various muddy coloured chairs from the seventies, and some dodgy art on the walls ranging from an impressionist print through to something by someone in the department. The guy was from somewhere up north and worked on inertial confinement fusion and the artist woman had just stepped through the sliding aluminium patio doors from the roof top. It was a day or two after the August riots - cloudy, cool and blustery, threatening rain and she had been the only one out there, except for the little astrophysicist who went out for a smoke. After collecting tea at the hatch from the jovial serving lady, they had settled around a low table. Sounded like the guy had thought about becoming a writer and was still thinking about it. He said he’d been bad at maths, though had become a theoretical physicist which surprised his maths teachers, particularly the string theory work. But, maths at school isn’t maths he said. Still it’s funny how things turn out. They talked about H P Lovecraft, Martin Amis, Roald Dahl....good short story writers and she offered Capote. The northerner said a twist in the tale is always good. 2. The Liouville equation for a probability distribution function, describing the interaction of N particles via some potential. It is the equation of (kinetic) plasma physics, but it has to be truncated and hacked away at before it gives anything useful away. The physicist said he was working on modelling what was going on in the thumb nail sized deuterium tritium target when it got blasted with laser beams to bring about a fusion ‘burn’ reaction. Piles of physicists before had done this, but for some reason never got round to including the strong (nuclear) force. When she raised her eyebrows disbelievingly, he looked up, ‘there is inertia in physics’ he shrugged. Anyway, this is what he was doing, though he was getting sick and tired of the computer coding. 3. The graph shows how different species in the burn phase of inertial confinement fusion equilibrate their temperatures over time, and how fantastically more energetic the fusion produced alpha particles (helium nuclei) are; this is because mass is converted into energy during the fusion process (according to a rather famous equation E = mc2) partly goes to them in the form of kinetic energy. Incredibly, they only receive 20% of the fusion energy, the remaining 80% going to neutrons which are not shown on the graph. He started drawing out his designs for a cloud chamber. This was his relief from the fusion calculations – to build something that reveals the tracks of the ionising particles that are everywhere around us – mostly from the heavens, though he might introduce a radioactive source borrowed from a smoke detector to liven things up. Their curved backs arched over the scribbles and for a while they talked about design in some detail. She said it might be cool to amplify the beautiful particle tracks by projecting them up on the side of the building for the passersby and the roaring traffic of South Kensington. For a moment her mind wandered and she asked herself if the particles were really making tracks. With the little drops of condensation, humans just thought of them like that. She wondered what the particles were really doing. Still they are beautiful and as the scientist said, strong magnetic fields will make them curve one way or the other according to charge. They went back to talking about nuclear fusion. 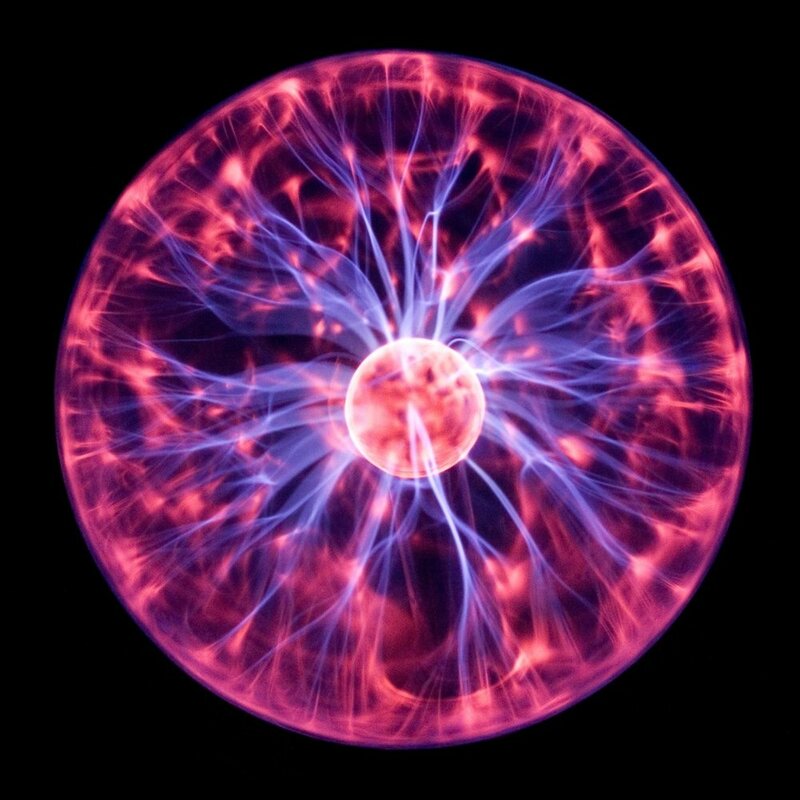 It’s better to take energy directly from the sun the physicist said, much better than recreating fusion on earth and handing out these sophisticated technologies that release the full force of nature around the world. The physicist said he was going north later in the summer to give a talk and he described experiments that would reveal the electrical intensity of nature to people. The first thought experiment carefully interleaved the pages of two telephone directories. It would take a crazy two ton force to separate them. He said it was electromagnetism. In a lull, she referred back to some previous conversation they’d had: something he’d said about seeing things in different ways. He kind of anticipated what she was saying and said there are quantitative and qualitative ways of looking at things. There was recognition in her face. They wondered about people who couldn’t figure things out quantitatively......she said a scientist friend had berated her, saying it’s no good trying to explain what string theory is, it’s not even useful to explain the path of a falling stone, best to get people calculating how long they spend travelling, cooking or sleeping each year.....get them to see how numbers can overlay and reveal things about life. They both thought there was a lesson for the politicians. Sounded like the physicist had a load of theologian friends from college who thought he was just fiddling around with his physics, keeping busy. When they knew the truth and had a direct line to the mind of God. People came and went and they must have talked for over an hour. Eventually they gathered up their pens and notebooks and chucked the plastic cups in the bin. They walked out through the hallway and stopped out in the stairwell. She held on to her glasses and they both held on to and leaned over the wooden railing to peer up and down the vertiginous drop marvelling about the space and height. He wanted a Foucault pendulum and she thought it would be interesting to have strings that people could pluck running from top to bottom, anything that would make them stop and take in the space - the whole cavity as a musical instrument. All those patterns, all those simple harmonic oscillators she said. And he laughed and said they are everywhere in physics and solvable. She took her hand away from the banister and went up the stairs, he carried on down and she continued to say something to him. Arthur Turrell is working on his PhD, theoretically modelling the burn in an inertial confinement fusion reaction. He is also a scientific journalist with a passion for outreach and science communication. He plays tennis badly, but enthusiastically and reviews popular science books for correctness before printing. He enjoys reading and hopes to do a degree in literature one day.